Failure is the key to success, each mistake teaches us something. "Morihei Ueshiba"
Integrity is the essence of everything successful. "R. Buckminster Fuller"
Success is doing ordinary things extraordinarily well. "Jim Rohn"
Failure is success in progress. "Albert Einstein"
One can have no smaller or greater mastery than mastery of oneself. "Leonardo Da Vinci"
I can't give you a sure-fire formula for success, but i can give you a formula for failure: try to please everybody all the time. "Herbert Bayard Swope"
The secret of success is sincerity. "Jean Giraudoux"
The first requisite to success is the ability to apply your physical and mental energies to one problem incessantly without growing weary. "Charles Caleb Colton"
The key to success is to focus our conscious mind on things we desire not things we fear. "Brian Tracy"
Success is how high you bounce back when you hit bottom. "George S. Patton"
It is better to fail in originality than to succeed in imitation. "Herman Melville"
Behind every successful man there is a lot of unsuccessful years. "Bob Brown"
One secret of success in life is for a man to be ready for his opportunity when it comes. "Benjamin Disraeli"
Success is the good fortune that comes from aspiration, desperation, perspiration and inspiration. "Evan Esar"
One important key to success is self-confidence is preparation. "Arthur Ashe"
If you have no critics you will likely have no success. "Malcolm X"
Forget the past. "Nelson Mandela"
The true success is the person who invented himself. "Al Goldstein"
So i feel like success is opportunity plus preparation, so work begets work, and as long as you are prepared it's going to continue to come your way. "Anthony Mackie"
Success is not the key to happiness. Happiness is the key to success. if you have what you are doing, you will be successful. Success is simple. Do what's right, the right way, at the right time. "Arnord H. Glasow"
Success consists of going from failure to failure without loss of enthusiasm. "Winston Churchill"
Winning is a habit. Unfortunately, so is losing. "Vince Lombardi"
Many of life's failures are people who did not realize how close they were to success when they gave up. "Thomas Alva Edison"
Success is the progressive realization of predetermined, worthwhile, personal goals. "Paul J. Meyer"
Successful people are always looking for opportunities to help others. Unsuccessful people are always, "what's in it for me?". "Brian Tracy"
Do your best when no one is looking. if you do that, then you can be successful in anything that you put your mind to. "Bob Cousy"
The part to success is to take massive, determined action. "Tony Robbins"
I have missed more than 9,000 shots in my career. I have lost almost 300 games. 26 times i have been trusted to take the game's winning shot and missed. I have failed over and over and over again in my life and that is why i succeed. "Michael Jordan"
There is no gains without pains. "Benjamin Franklin"
Success is about enjoying what you have and where you are, while pursuing achievable goals. "Bo Bennett"
Most of the successful people i have known are the ones who do more listening than talking. "Bernard Baruch"
I don't believe the most successful people are the ones who got the best grades, got into the best schools or made the most money. "Ben Stein"
The best revenge is massive success. "Frank Sinatra"
The secret of success is to do the common things uncommonly well. "John D. Rockefeller"
Success is liking yourself, liking what you do, and liking how you do it. "Maya Angelon"
True success, true happiness lies in freedom and fulfillment. "Dada Vaswani"
Work for something because it is good, not just because it stands a chance to succeed. "Vaclav Havel"
Integrity is more valuable than income. Honor is richer than fame. Self-worth is wealthier than Net-worth. "Robin Sharma"
To be successful be ahead of your time, but only a little. "Mason Cooley"
Success is relative. it is what we can make of the mess we have made of things. "T.S Eliot"
Actually your past successes are your biggest obstacle: every battle, every war, is different and you cannot assume that what worked before will work today. "Robert Greene"
If you want to be successful, surround yourself with people who are more successful than you are, but if you want to be happy, surround yourself with people who are less successful than you are. "Naval Ravikent"
Each success only buys an admission ticket to a more difficult problem. "Henry A. Kissinger"
The season of failures is the best time for sowing the seeds of success. "Paramahansa Yogananda"
Success is not always going to be a huge contract; success is going to be if you just live out your purpose in life. "Allan Houston"
Behind every successful person has a pack of haters. "Eminem"
You never achieve success unless you like what you are doing. "Dale Carnegie"
Success comes from curiosity, concentration, perseverance and self-criticism. "Albert Einstein"
People just don't understand how obsessed i am with winning. "Kobe Bryant"
Hope this help in your cause as you soar high in 2019. I love the famous phrases! I've always collected them because they give me inspiration! It's indeed a great quote. The Winston Churchill quote is my absolute favorite. It's amazing how so many of these quotes are older but the lesson behind them is simply timeless. I'm learning a lot from the quotes. And I'll agree that success is a habit indeed. I also love the quote, 'The secret of success is sincerity by Jean Giraudoux. People will always follow the authenticity behiond a person. Glad you are learning from them. Love them all! I have to screenshot some of them, just want it to see them on my phone always! I love this collaboration of quotes! 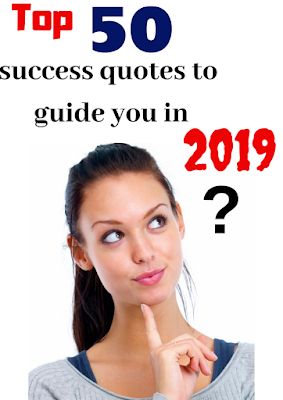 You have listed some awesome quotes here! All of these quotes are so awesome and inspirational. I totally love to read things like this when I am starting to feel down. Damn these are some golden quotes! I really love 31. It's the way to live life to the fullest and not hat yourself if you fail. I really love 31. It's the way to live your life to the fullest and not hate yourself if you fail. These are some great quotes. I will have to keep some of these down for this year to remember. Great things to put down in a journal. These quotes are all very inspiring, but what I like the most is Success is how high you bounce back when you hit bottom. "George S. Patton". There will always be trials before you reach success and the process before you reach it is the most rewarding. My favourite quote is "Success is liking yourself, liking what you do, and liking how you do it". This is so spot on to life! If you don't like yourself or what you do, all the perceived success means absolutely nothing. Love these quotes! We have a wall full of them to draw on when times are TOUGH.